ANSI: American National Standards Institute. This institute creates the engineering standards for North America. ISO: International Organization for Standardization. This is a world wide organization that creates engineeringstandards with over 100 participating countries. DIN: Deutsches Institut fur Normung. The German Standards Institute created many standards used world wide such as the standards for camera film. JIS: Japanese Indutrial Standard. Created after WWII for Japanese standards. MIL: The United State Military Standard. DOD: The United State Department of Defense Standard. 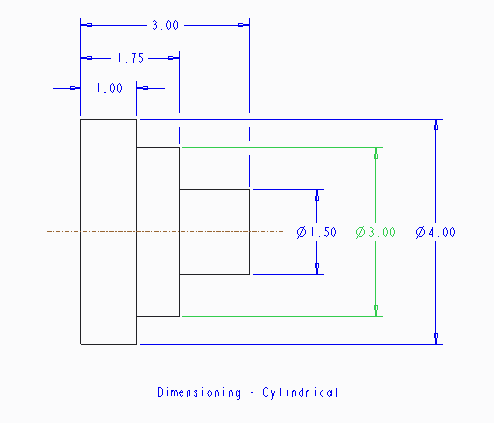 Dimensions are represented on a drawing using on of the two systems, unidirectional or aligned. 1. Dimensions should NOT be duplicated or the same information given in two different ways. 2. No unnecessary dimensions should be used. Only those needed to produce or inspect the part. The unidirectional (operating in a single direction) method means all dimensions are read in the same direction. 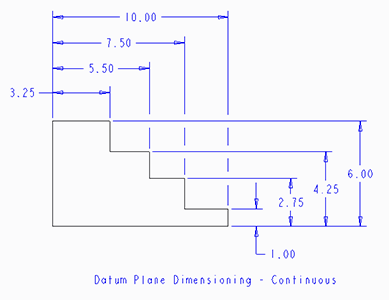 The aligned method means the dimensions are read in aligment with the dimension lines or side of the part, some read horizontally and others read vertically. 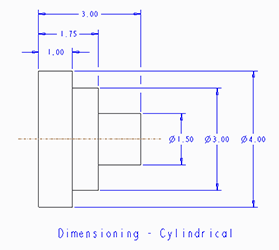 Types of Dimensions: There are two classifications of dimensions, size and location. Size: Dimensions are placed in direct relationship to a feature to identify the specific size. 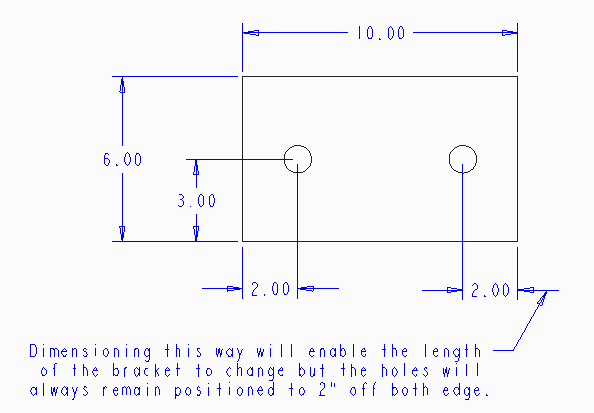 Location: Dimensions are used to identify the relationship of a feature to another feature within an object. Decimal inches (prefered), fractional inches, feet and fractional inches. SI or metric, millimeter (mm). Leading zero: Metric (yes), inches (no). 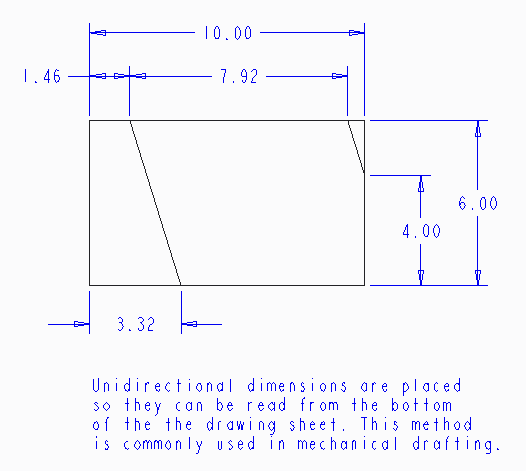 If units (e.g., In or mm) are not included with each dimensions, specify the units used with a note on the drawing: UNLESS OTHERWISE SPECIFIED, ALL DIMENSIONS ARE IN INCHES. Each dimension should be written clearly with only one way to be interpreted. A feature should be dimensioned only once. Dimension and extension lines should not cross. Each feature should be dimensioned. Dimension features or surfaces should be done to a logical reference point. Dimension circles should have diameters and arcs with a radius. A center line should be extended and used as an extension line. 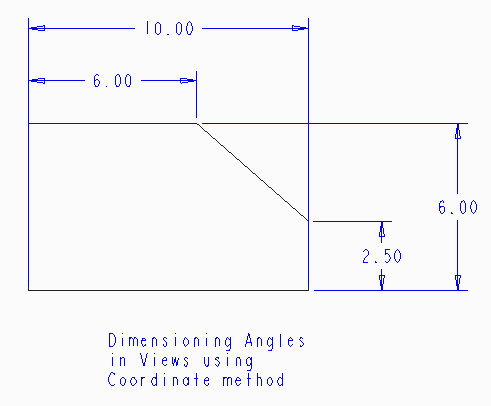 Dimension features on a view should clearly show its true shape. Enough space should be provided to avoid crowding and misinterpretation. Extension lines and object lines should not overlap. 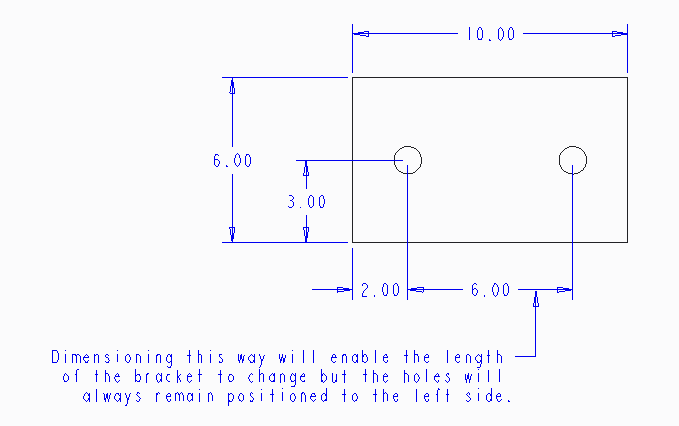 Dimensions should be placed outside the part. Center lines rmarks should be used on all circles and holes. 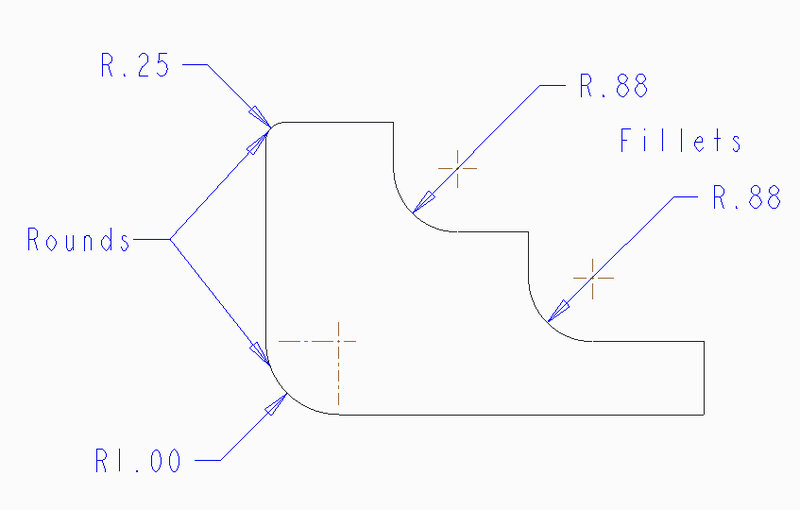 Standard Linear Dimensioning: Dimensioning from feature to feature is known as Chain Dimensioning. It is commonly used and easy to lay out. It does have possible consequences in the manufacturing of a part. Tolerances can accumulate, making the end product larger or smaller than expected. The accuracy of the final product is determined by the dimensions on the drawing. 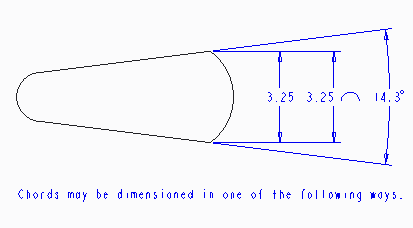 If all the dimensions originate from a common corner of the part, the object will be accurate. 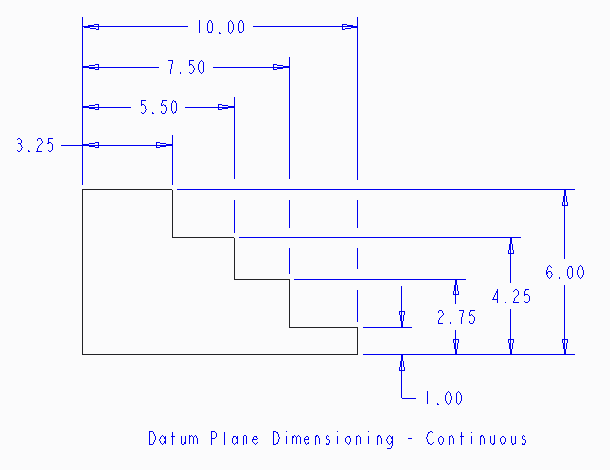 This is refered to as Datum Dimensioning. Datum insure the tolerance or errors in manufacturing do not accumulate. 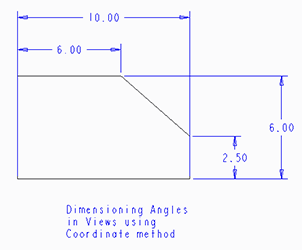 Dimensioning Angles: Angled surface may be dimensioned using coordinate method to specify the two location distances of the angle. 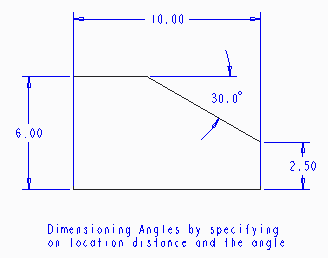 Angle surfaces may also be dimensioned using the angular method by specifying on location distance and the angle. 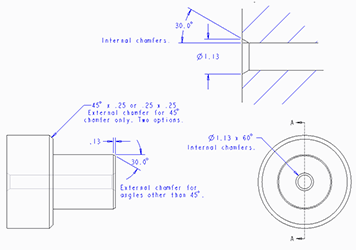 Dimensioning Arcs and Circles: Arcs and circles are dimensioned in views that show the arc or circle. Arcs are dimensioned with a leader to identify the radius; in some cases, a center mark is included. Circles should have a center mark and ar dimensioned with a leader to identify the diameter. Dimensioning Curved Features and Arcs: The arrow can be inside for small arcs. Small arcs do not need center marks. Arrow can be outside. Large arcs use center marks. Use a capital "R" for dimensioning arcs. A center line is a dark line composed of alternate long and short dashes, and is used to represent the axes of symetrical parts or to denote centers. Do not create a gap when the centerline crosses the part outline. A centerline must end with a long dash. 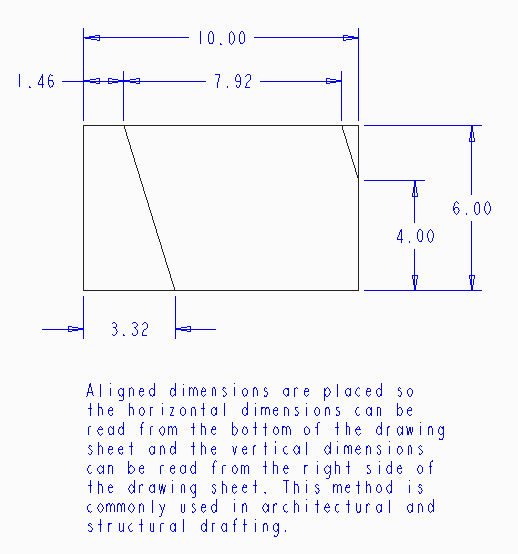 Reference Dimensions: Designates more than one of the same feature. In this case, it is identifying there are two identical radius. 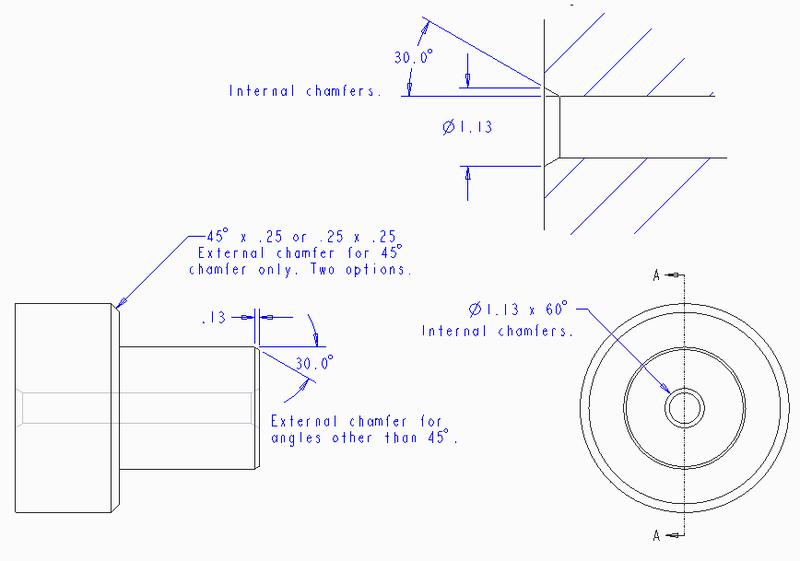 Chamfers: There are two options for external chamfer for 45 degree chamfer and basic dimension for angles other than 45 degrees and internal chamfers. Fillets and Rounds: Large arcs use center marks. Small arcs do not need center marks. Arrow can be outside the arc. Use capital "R" for dimensioning the arcs. Conical Tapers — Slot Dimensioning — Dimensioning Radial Patterns — Keyways and Keyseat...to be continous.